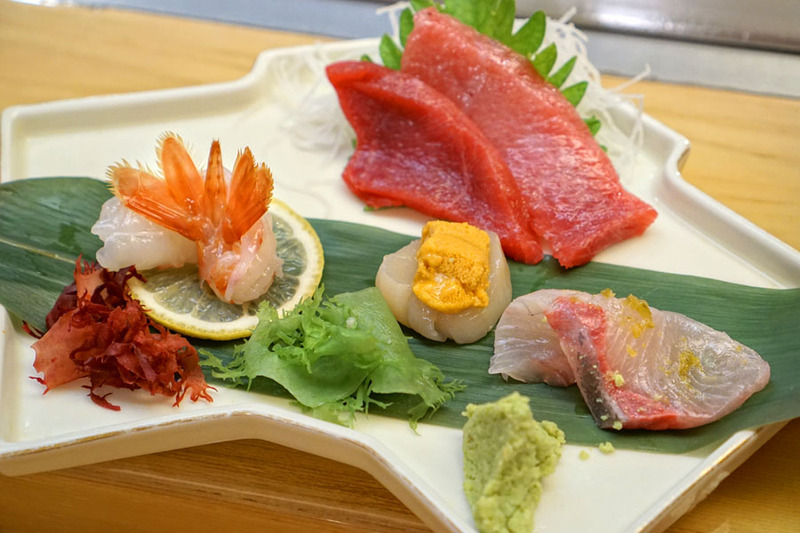 Situated on the third floor of the Little Tokyo Galleria, Sushi Go 55 is actually one of the more storied sushi spots in SoCal. 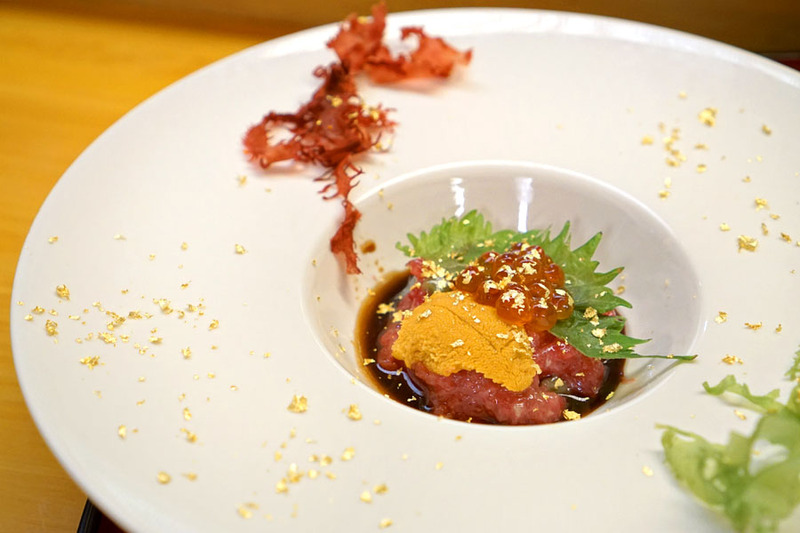 The restaurant traces its history to 1929, when the Morishita family launched their first Japanese restaurant in LA. That eatery ran for about a decade, and the family ended up moving back to Japan during World War II to avoid internment. Following the end of the conflict, Roy Morishita returned to the US and re-launched Eigiku Cafe at 314 East 1st St in 1957. 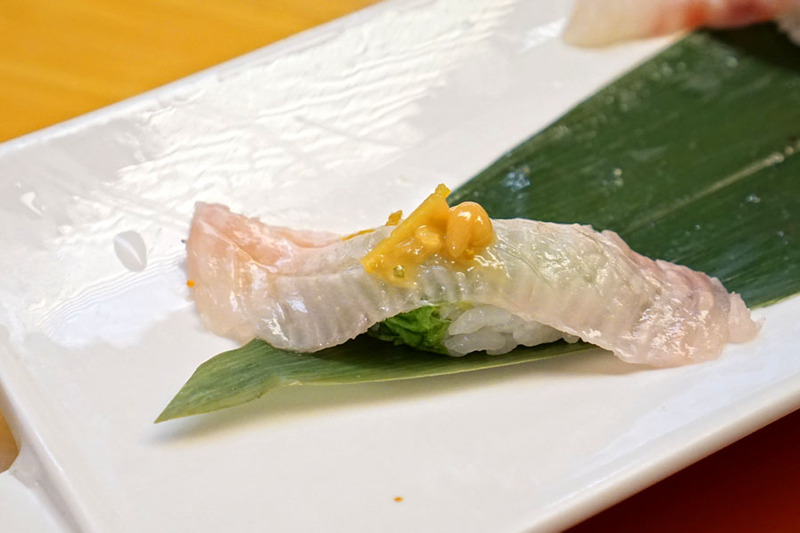 In ~1966, Eigiku added what's often considered America's second sushi bar (the first was installed at the nearby Kawafuku about six months earlier, while the third was at Tokyo Kaikan, where the California Roll was ostensibly invented). 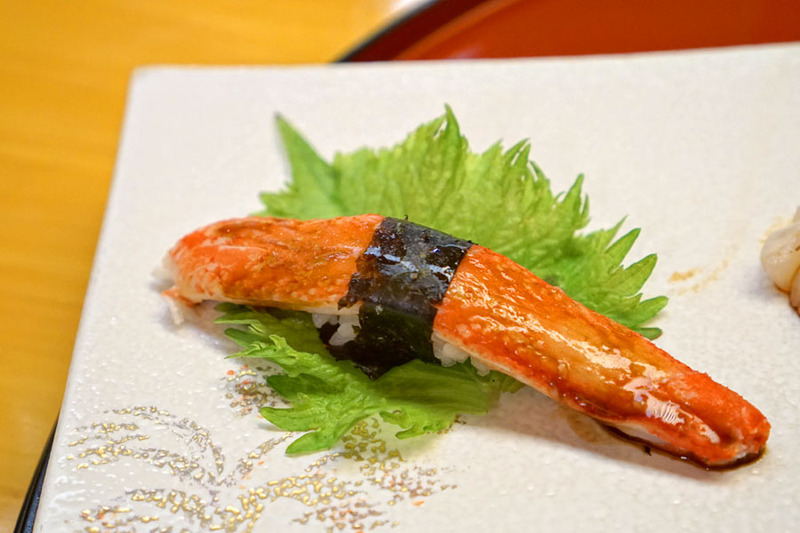 In the 1980s, a second location called Seafood-Sushi Eigiku debuted in Santa Monica Place, while the original Eigiku closed in 1987. 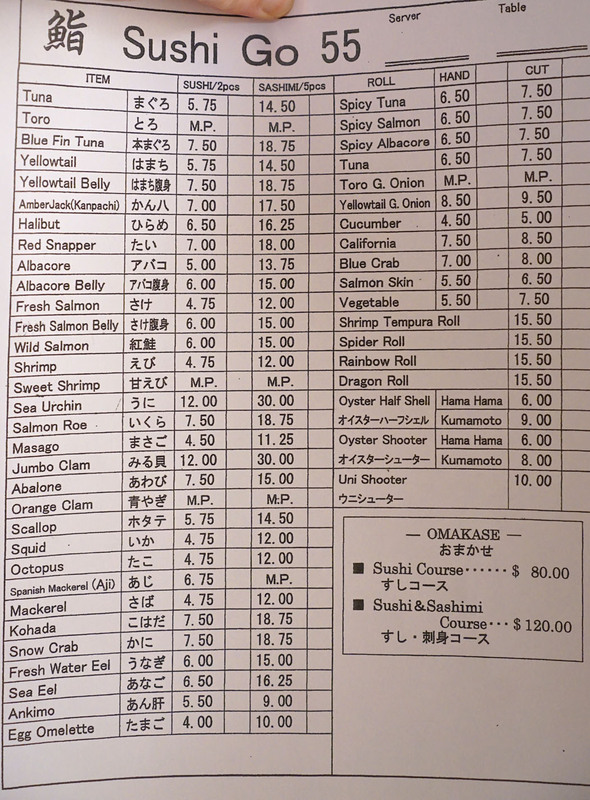 Sushi Go 55, meanwhile, was opened in September 2004 by Tomoko Morishita in the spot previously occupied by Kawacho, Tsukara Sushi, and Shibucho. Morishita debuted Izakaya Haru Ulala in 2005 at the former address of Haruki/Furaibo, but the place closed at the end of 2014, and was subsequently replaced by ramen shop Hakata Ikkousha. 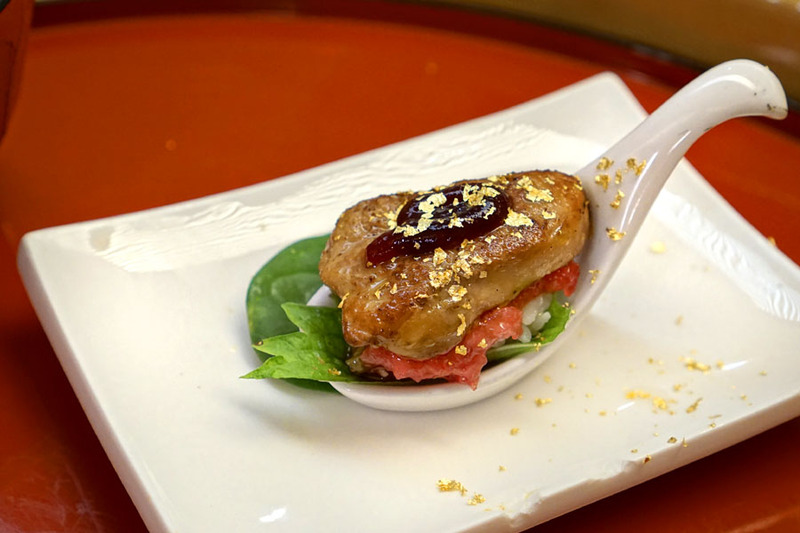 Go 55's menu features your usual sushi selections as well as a number of appetizers/cooked dishes. 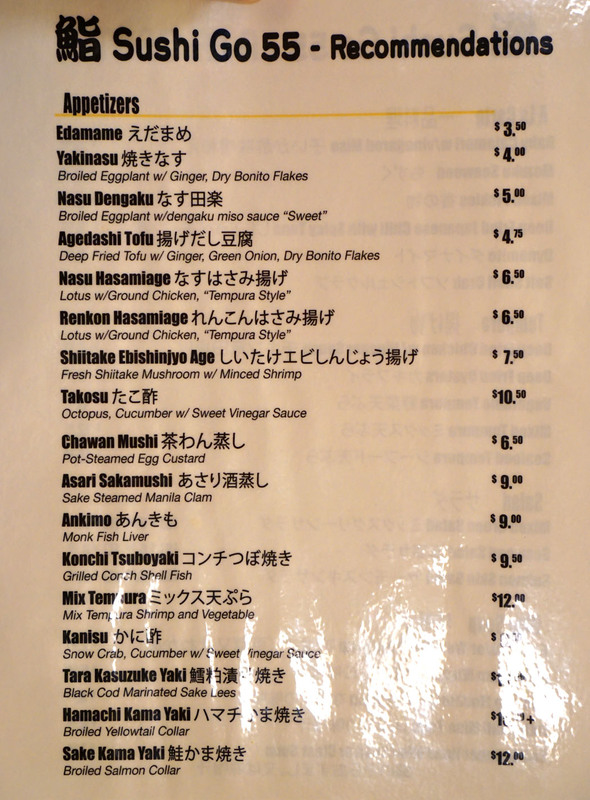 There are also two omakase options, at $80 and $120 a head. We ended up going with the higher-end option, prepared this evening by Oki-san, who claims over 40 years of cooking experience (including 1.5 years here). 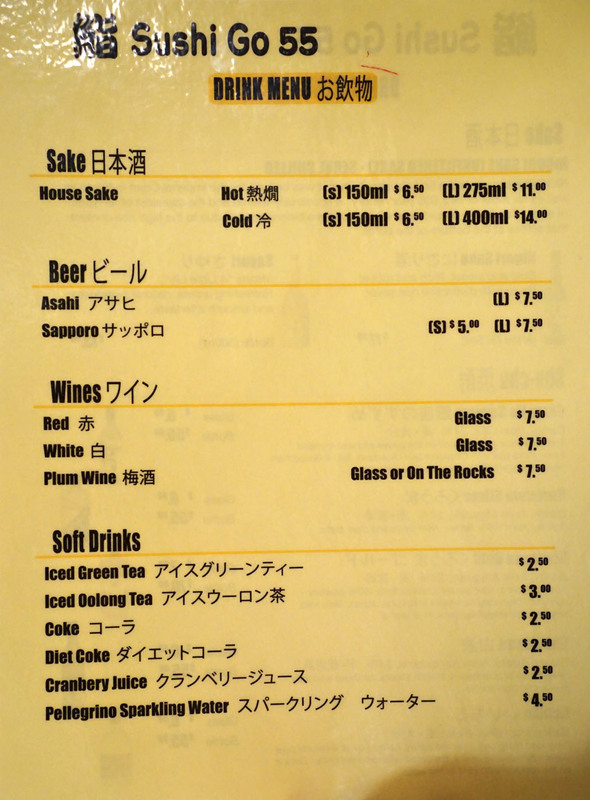 To drink, you get an array of sakes, shochus, and beers. Corkage is a sensible $20 per bottle. Click for larger versions. A starter of monkfish liver was pretty textbook: lush and dense and briny, but evened out by the sour-savory ponzu and zesty scallions. 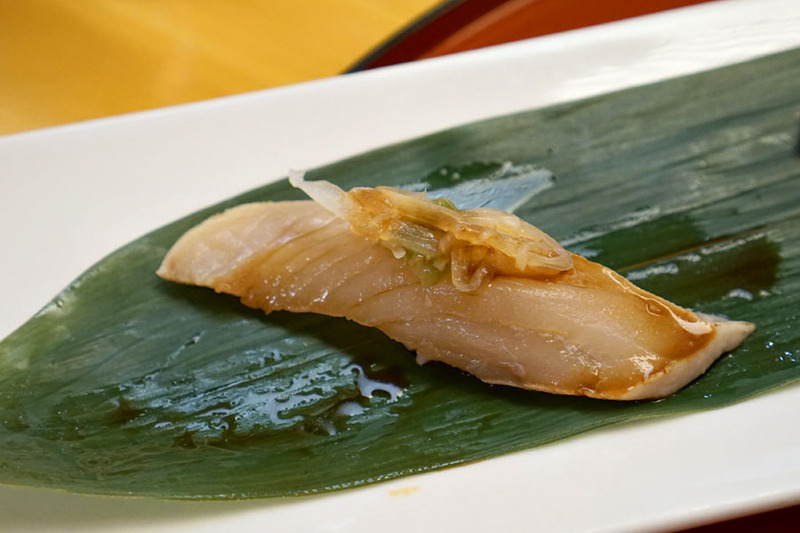 Kanpachi - A delicate fish, accented but not overwhelmed by the salty-spicy-sour smack of yuzukosho. 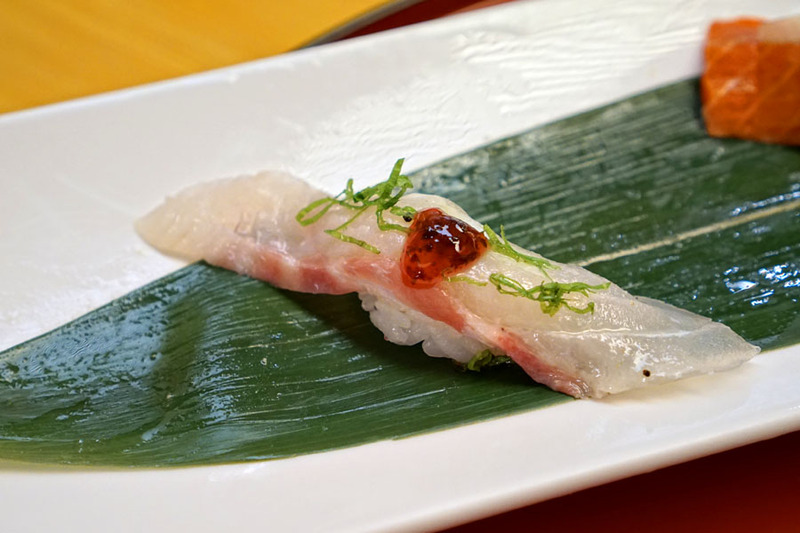 Kuromaguro - A classic cut for sure, one that really opened up with a dab of 'sabi and soy. Hotate to Uni - A marriage of two different interpretations of sweetness and brine, finished by an unmistakable wasabi heat. 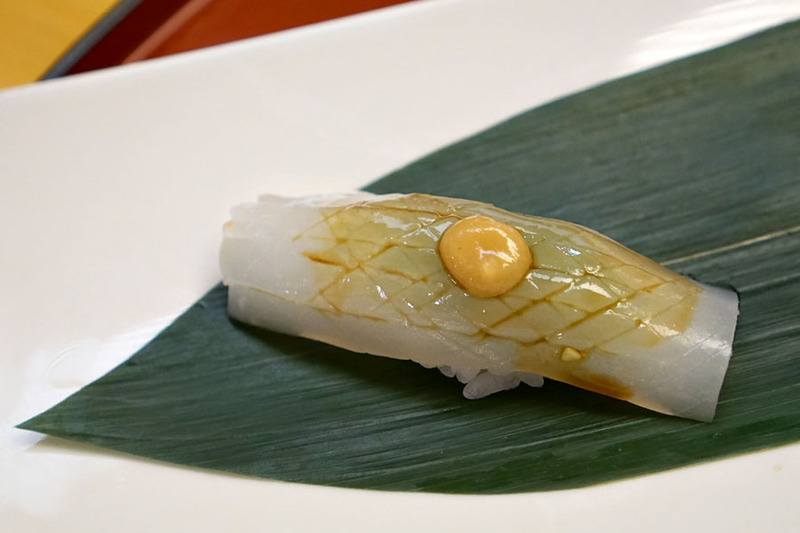 Amaebi - Creamy yet snappy at the same time, just as I'd expect, and great with a dab of wasabi. Kuromaguro Toro - Soft to the bite and super oily, this one really called for wasabi and soy for balance. 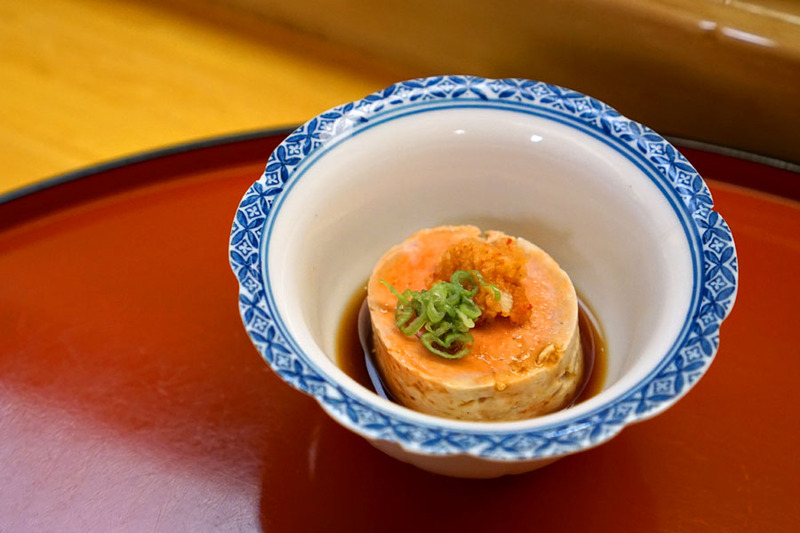 Toro was imbued with heady flavors of shoyu and truffle, on top of which we had a back-and-forth between salmon roe and sea urchin. Seaweed served as a counterpoint, but the best part were those delightfully zippy bits of wasabi mixed in with the tuna. At this point we began with the nigiri, which were served two-to-three at a time (I'd prefer individually of course). Halibut was accompanied by a tart, fruity topping, while the back end really showed off the mintiness of shiso. 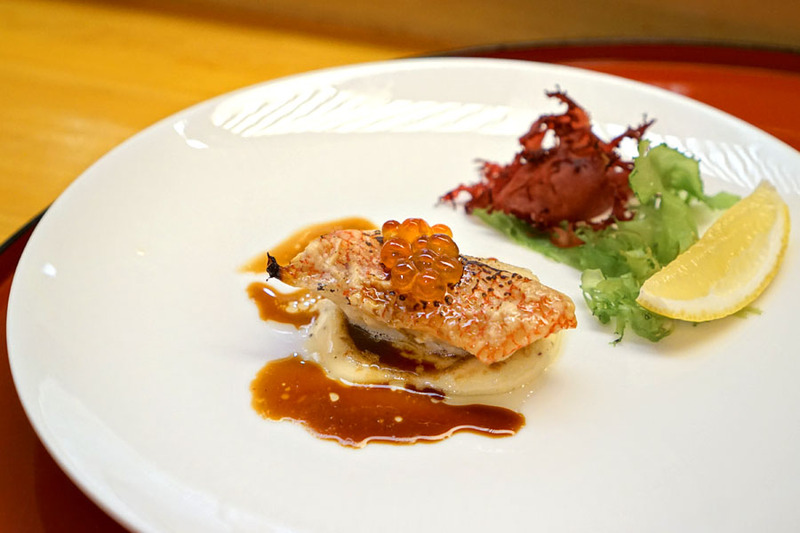 Red seabream conveyed an interplay between salinity and shiso, with the tartness of the umeboshi(?) sauce functioning as an accent piece. 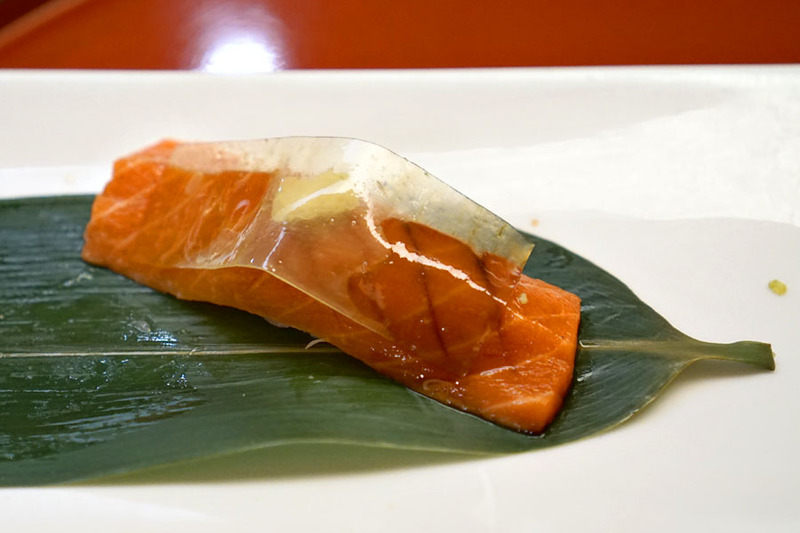 Wild salmon arrived distinctly savory and smoky, while the sheet of tangy pickled kelp imparted an offsetting sourness that worked. 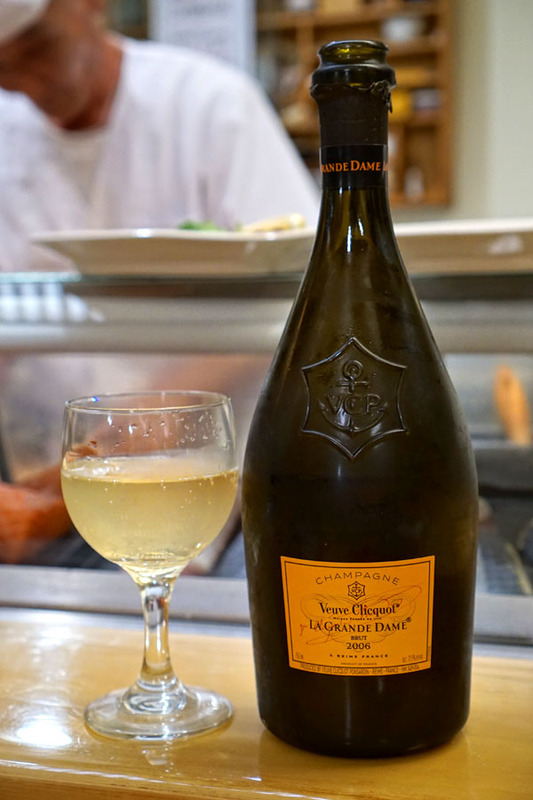 We had a bottle of 2006 Veuve Clicquot Ponsardin Champagne Brut La Grande Dame to go along with the sushi. The wine smelled quite nice, giving up notes of juicy apple, yeast, and light lemon; I found it somewhat reminiscent of apple cider in fact. The palate was very balanced, yielding subtle toast, citrus, apple, minerals, flowers, and a bright acidity. A tasty sparkler overall, though it'd improve with more age. Snow crab ate savory and almost truffle-y at first, but had a super sweet brine that came through on the finish and lasted long. Scallop came out slightly seared, and thus had a great smokiness and astringency to go along with its inherent sweetness. Nice hit of wasabi here, too. 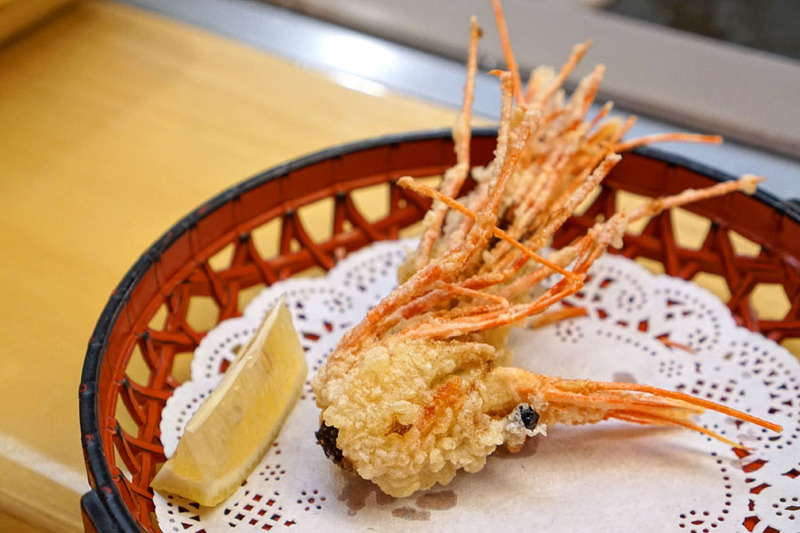 The fried shrimp head from the ama ebi above was as enjoyable as always. 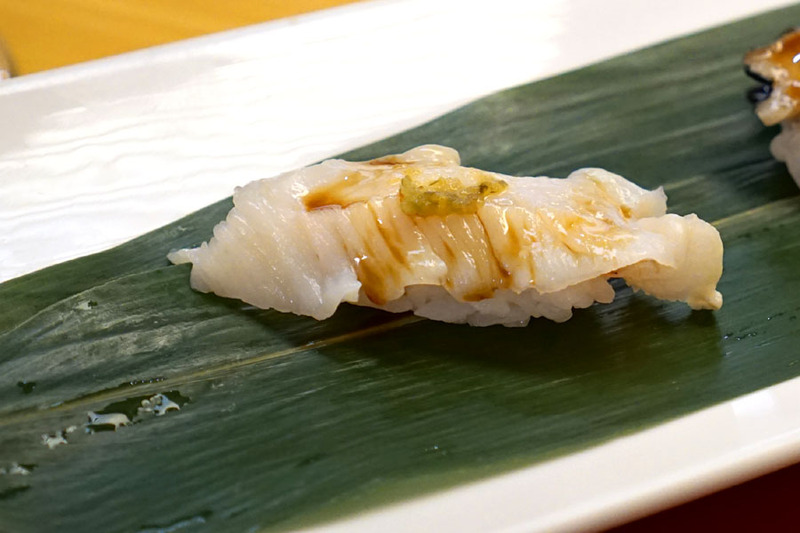 Squid was sweet and sticky, its mild flavors enhanced by judicious applications of 'sabi and shiso. 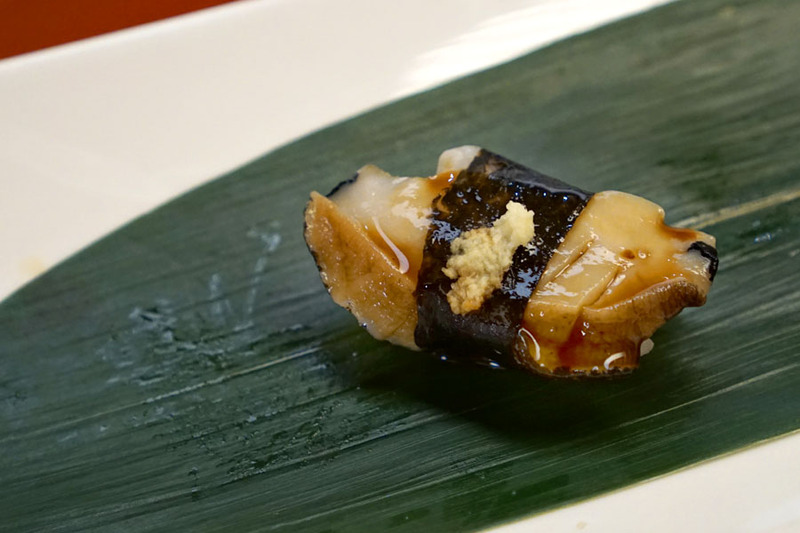 Abalone was almost crunchy to the bite, with a strong ocean-y taste that was balanced out by the wasabi and rice. 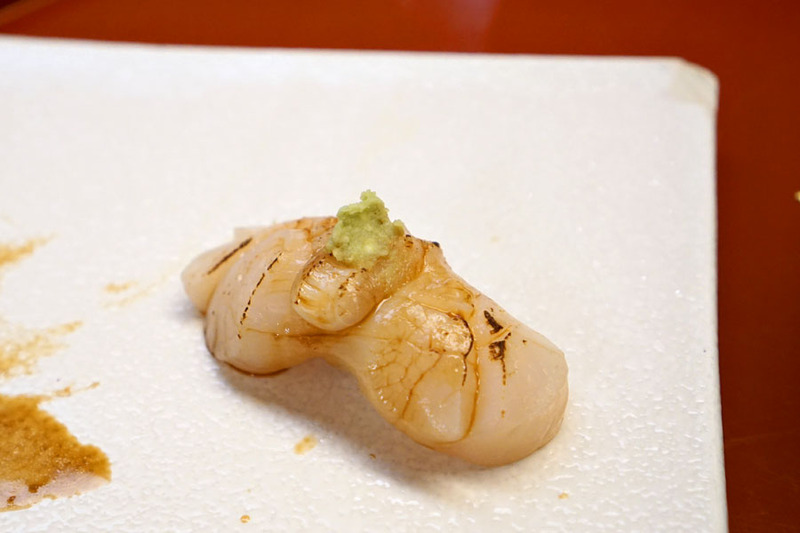 Texturally, geoduck had a satisfyingly firm yet pliant consistency, along with a definite sweetness joined by lots of wasabi and a touch of yuzukosho. Next up was grilled, marinated idiot fish (or shortspine thornyhead), which you don't see that often on menus. I found it super rich, I'd say buttery in fact, and it also had a truffle-like funk to it. The included purée (parsnip?) worked as a counterweight, and I didn't mind the salty pops from the salmon eggs, either. 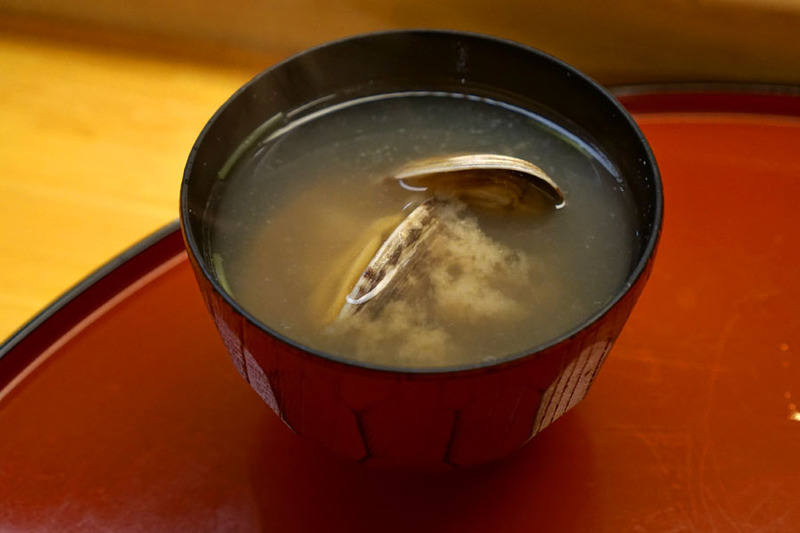 The miso soup was extra saline thanks to the incorporation of clam. 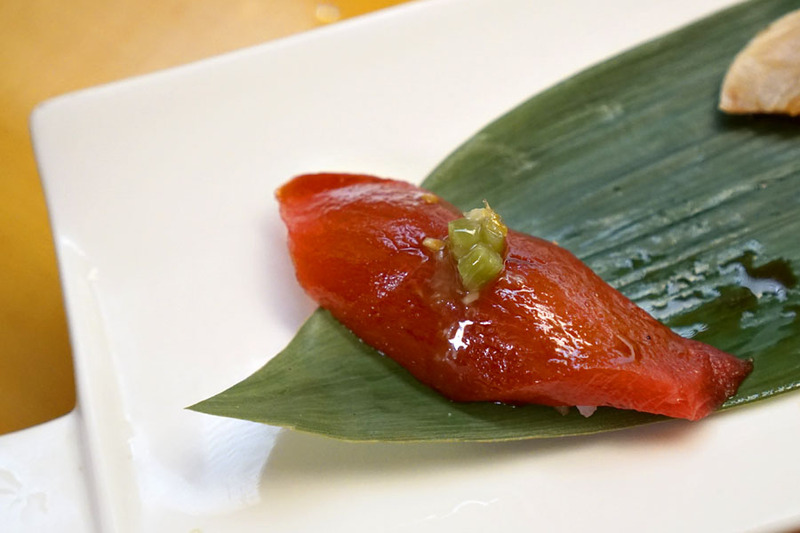 A glistening cut of bluefin tuna was slick and soft, and really sang with that dollop of wasabi. Albacore showed off flavors of soy and truffle, with the onions up top providing a well-placed tartness and crunch. 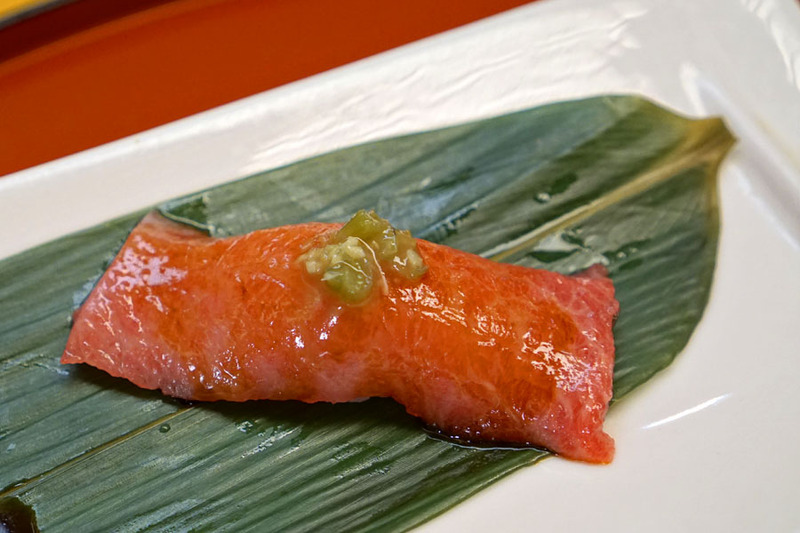 Bluefin belly was nearly melt-in-your-mouth, its sheer fattiness and oiliness matched by just enough wasabi and soy. Here we had perhaps the most interesting bite of the night. The seared foie was as rich and luxurious as one would want, but also had a nice smoky sear to it. It actually meshed well with the comparatively delicate tuna, while the rice effectively moderated it all. Surprisingly balanced I have to say. 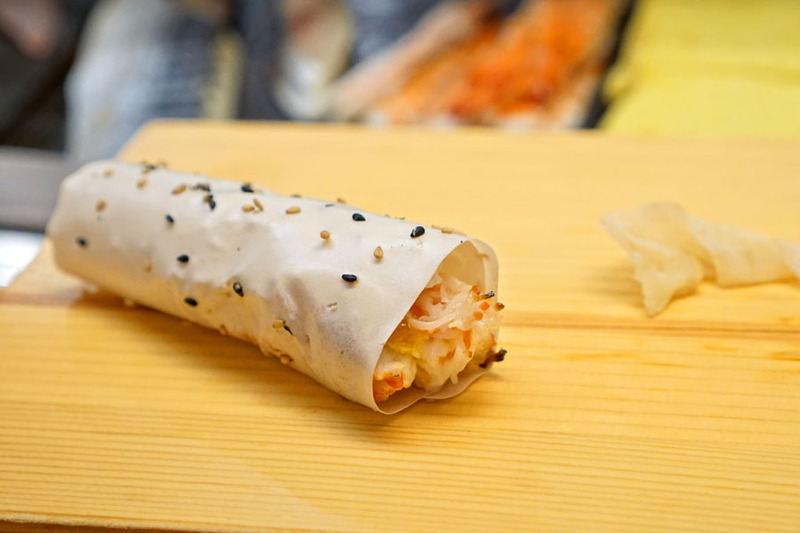 A baked snow crab hand roll signaled the end of the meal. The actual crab was rather intensely flavored, and had an almost buttery quality to it. Given its heft, the rice was absolutely key, as was the dish's hint of wasabi heat. I also appreciated the nuttiness from the bits of sesame on the roll's mamenori (soy paper) wrapper. 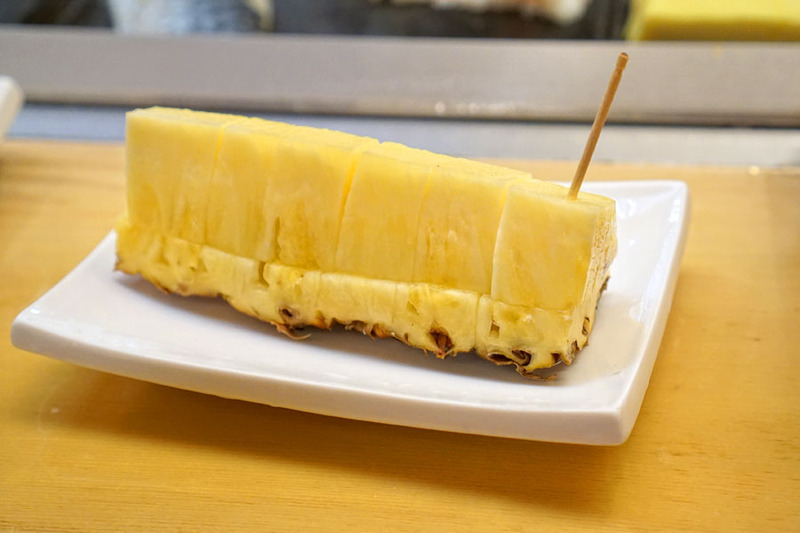 The pineapple seemed much sweeter than usual, and worked as a refreshing counterpoint to all the hefty flavors we'd been having. I'd actually been to Go 55 previously, but I'm glad I finally made it back here and documented the experience, as this was certainly one of the better sushi meals I've had in Little Tokyo. 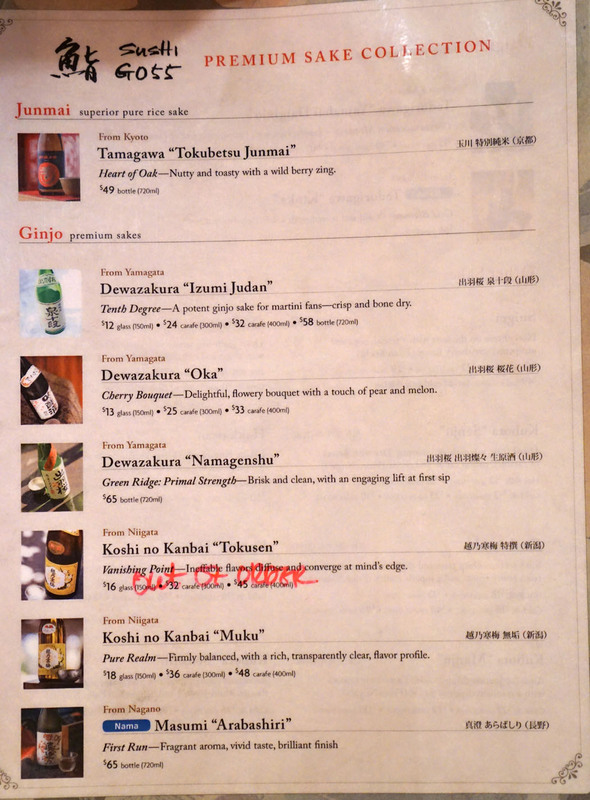 The food was mostly traditional, but there were definitely a number of more unexpected flourishes that I didn't mind. 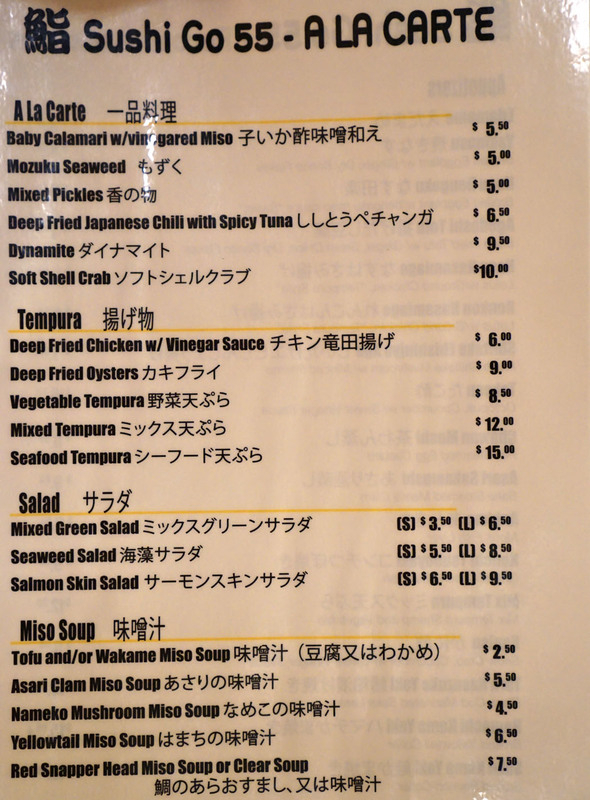 However, it appears that the restaurant might be closing in the near future, so if you want to try this place, I'd visit sooner rather than later. If you look at the exterior photo above, you'll notice a "Public Notice of Application for Ownership Change" posted on the window. 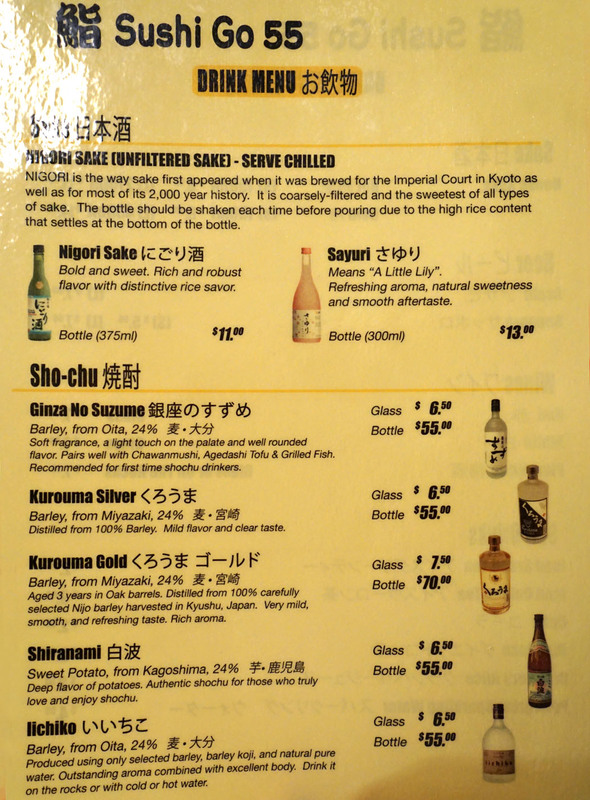 After checking the Alcoholic Beverage Control web site, I saw that Go 55's liquor license was transferred to Takayama Group Inc back in December. That entity is owned by one Ken Peter Takayama, which makes me wonder: is this the same Ken Takayama that's Chef de Cuisine at Melisse? 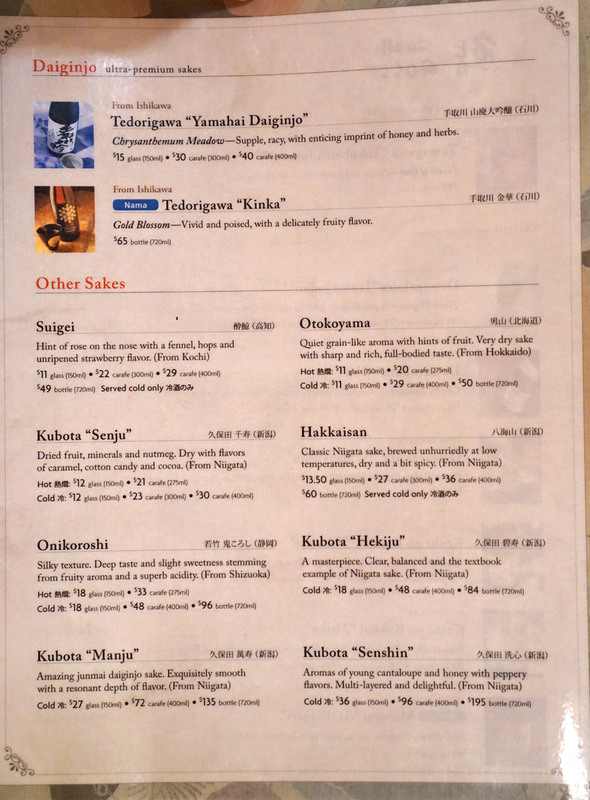 We know that Melisse is shuttering at the start of March, so could Takayama be striking out on his own and opening up shop in Little Tokyo? Time will tell. Sad to hear that it may be closing -- I tried looking online but didn't see anything. Is there a source for that? Kevin put them out of business by always bringing his own alcohol. What happened to the quality of your images? Resolution is way off from what it used to be.